Our primary service area is Toronto and the GTA, however we do events in Niagara, Muskoka, Barrie, London, Whitby, Milton, Vaughan, and Central/Southern Ontario. If you’re looking to rent us for an event outside of our standard sections, simply send us an e-mail and we can chat! What's the benefit of a VW photo booth over a traditional photo booth? This is one we get a lot. 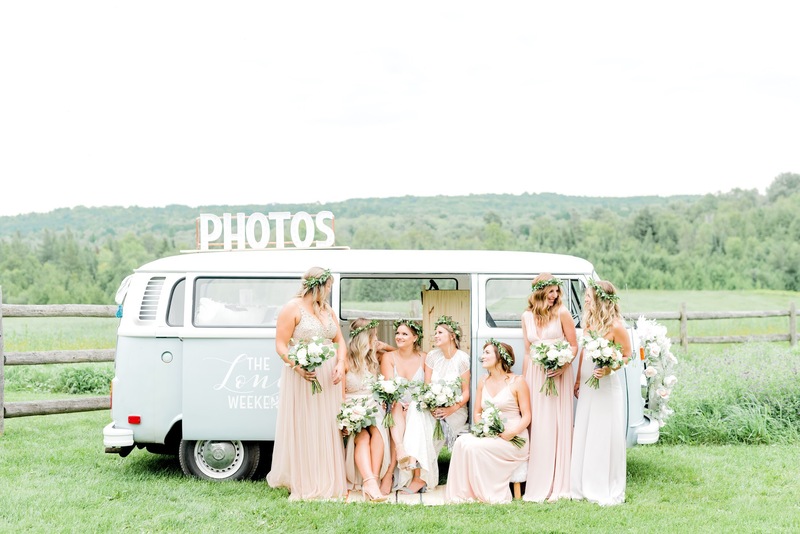 Traditional photo booths are amazing additions to an event, but for a lot of guests it’s a little ‘been there, done that.’ With the VW Bus Photo Booth, the novelty of a vintage vehicle has a big draw for guests of all age. You’d be surprised how fast your 82-year-old grandma becomes a 17-year-old hippie all over again as soon as she steps back into the bus! The amount of people who use our VW bus photo booth versus standard photo booth events we’ve done before in the past is ten fold, so your rental fee ends up being well worth it. How many people can fit in the bus at once? Four! There’s a bench that fits three in the back, and a passenger seat in the front. What sets The Long Weekend apart from other VW Bus Booths? It’s all about quality and customization. Despite being a 40+ year old bus, our girl Betty has been fully restored as a fully functional, works-like-new bus. She has all new seats, new wooden floors, and a sparkly new paint job that makes her appearance at events and in photos absolutely next level in comparison to other options. On top of that is the flexibility. We know that different events have different needs, so we can customize any package based on the needs of you and your guests. Whether that means adding custom decor, having extra how-to signage, having an extra person on hand to help guests or simply bringing the bus to a town she usually doesn’t go to, The Long Weekend team makes sure that you get the exact experience you want at each and every party. That all depends on the package you want! We have standard pricing packages for all of our big offerings. To get a PDF of our prices, send us an e-mail and we’d be happy to get one to you! What time will you arrive to set up the photo booth for weddings and events? Whatever time you want us there! We work on your schedule and will set up before the agreed upon start time. If you want your event to start at 4:00PM, we’ll get there around 3:00PM to get set up. Any setup and teardown time doesn’t count towards the total time of your event. Can you rent just the hashtag printer? Sure! Throughout the winter and on any day we don’t have a bus event scheduled, we’re happy to rent out the hashtag printer as an awesome photo booth option for people without the space to host the bus. We’ll bring our standard how-to signage, light boxes to host your event hashtag, and touch screen surface for guests to select and print photos as they choose. If that’s the case, we’ve failed at our FAQ. Luckily we’re really good at e-mail. Head over to our contact page and we’ll be happy to answer any questions you have left over!